Do you enjoy the conscious life? 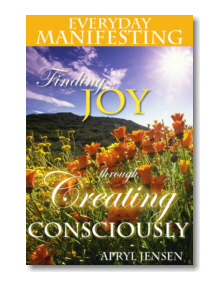 Make 2007 your year to accelerate your awareness of how you consciously create your reality. 1) Realize Your Wholeness and Goodness. 2) Discover and Use Your Emotional Guidance System. 3) Align Yourself with the True Nature of the Universe. 4) Mobilize Your Thought Power to Create Your Own Reality. 5) Develop the Power of Choosing Your Thoughts Consciously. 6) Succeed in Achieving Emotional Freedom by Knowing Your "Why". 7) Harness the Power of Your Quiet Meditative Mind. 8) Simplify and Focus Your Conscious Desires. 9) Adopt the Power of Daily Gratitude. 10) Trust the Conscious Universe to Provide For Your Needs. 11) Notice Your Conscious Manifesting Power in Small Ways. 12) Accept the Flow and Rhythm in Consciousness Cycles. Download your PDF copy below. Just right click and "save target as" and save to your desktop. Then open and read. Yes, you can give it away. I only ask one favor. If you find these twelve ideas help you consciously create in your life, please forward them on to at least one other person. You can attach the free PDF to your email, or just send them back to this page. Enjoy the report, and if you are interested in finding joy through creating consciously, then click on the image below.